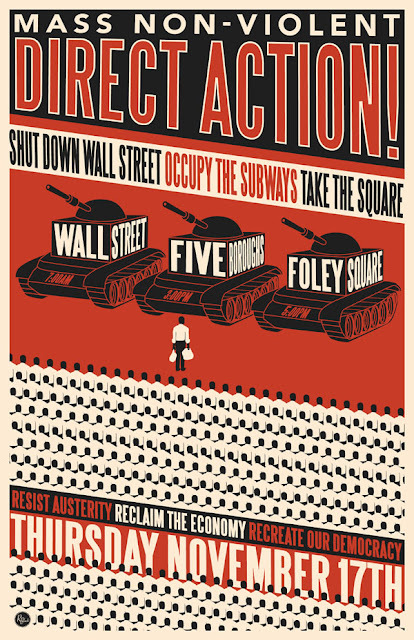 Today is scheduled to be a big day for the Occupy Wall Street (OWS) movement as they are planning on occupying the New York Stock Exchange (NYSE), part of the subway system, and Foley Square. This is an all-day, 3-part event that is scheduled to begin at 7AM EST and end with the protesters gathering for their third and final stop of the day at 5PM at Foley Square. More detail about today's events will be covered later in this post. I went to the OWS facebook page last night to see what people were discussing and I found an array of opinions and attitudes about today's planned events in the comment sections. The video below is a collection of those various comments. Some were supportive of OWS, some were not; the video contains a mixture of both types of comments. This next video gives you an idea of what some of the protesters have in mind for today. This was recorded on Tuesday night, November 15th, after the protesters were evicted by the NYPD from Zuccotti Park where they had been camped out for the past couple of months. The "official poster" for today's scheduled "day of action" is below. Take a close look at it and notice all of the subtle details. It's Time for the 99% to declare an Economic Emergency. 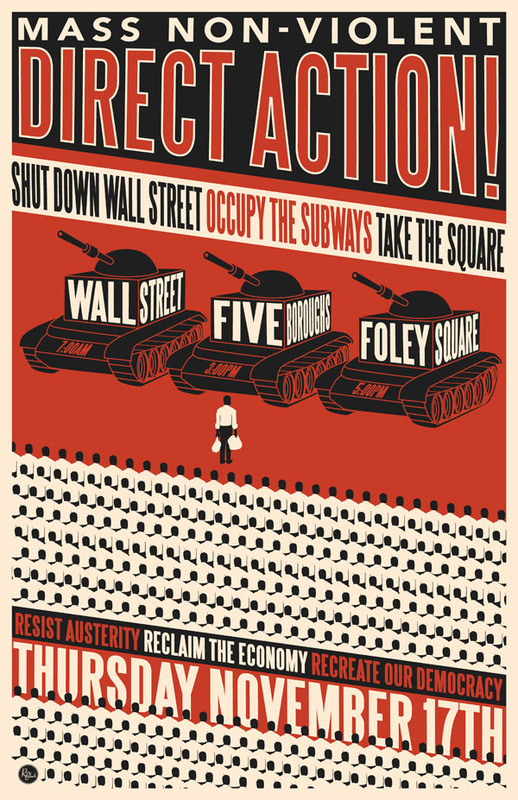 And on November 17th, 5PM at Foley Square, we'll do just that. Mayor Bloomberg's attempts to shut down the Occupy Movement was a bad move. Now it's time to take our city back. • November 17th is a national day of action against policies that have enriched the 1% and impoverished the 99%. It is a day to focus the anger of our growing movement on... Congress’ failure to create good jobs for the unemployed while at the same time it pursues job-killing budget cuts to pay for more tax cuts for corporations and the rich. • Enough is enough—we can’t wait any longer. Three years after Wall Street wrecked our economy, 25 million people are still unable to find full-time work and the scandalous gap between the 1% and the 99% continues to grow. But instead of creating jobs, Congress continues to ignore the concerns of the 99%, and focuses on job-killing budget cuts and tax giveaways for the rich. To see the full schedule of events, as well as links to two other facebook event pages related to today's activities, go HERE to read the entire description of this event. As evidenced in the 1st video in this post, there are more protests scheduled today in several other major cities in the USA as a "show of solidarity" with today's "Day of Action" taking place in New York City. As evidenced in the 2nd video in this post, some protesters may have plans for violence. Please pray for our police, our country, and for wisdom for the protesters.